According to a study by Knox and Inkster, a pair of Canadian psychologists, people are much more confident of their horses’ chances of winning just after placing a bet, than they are immediately before they lay down the bet. As Robert Cialdini explains, “Of course, nothing about the horses’ chances actually shifts; it’s the same horse, on the same track, in the same field, but in the mind of the betters, its prospects improve significantly once that ticket is purchased. Once a stand has been taken, the need for consistency pressured these people to bring what they felt and believed in line with what they had already done.” Markets are cyclical. Unfortunately, investors that stay fully invested, diversified, and ‘consistent’ until the end of this bear market will lose most of their funds. In our last article, we concluded that a greater than 50% correction in the Chinese indexes over the next 2-3 years was highly probable. On Tuesday, the Shanghai Composite Index plunged 8.8%, the most in 10 years. The downside percentage decline for the Dow Jones Industrial Average will be similar and will be detailed further in our next article. ‘Peacock theory’ used by pick-up artist Neil Strauss is a technique that calls for a man to stick out with flashy colorful dress to interest and attract the most desirable female at a bar. Perhaps this displays a man’s emotional security or his ability to take risks to a potential mate. (From our own experience: attractive women in Alabama tend to like men who look like they are from Midtown Manhattan, while Manhattan women love Alabama men.) It’s all about being unique. Similarly, successful advertising guru Seth Godin challenges advertisers to be memorable and remarkable. He has dubbed the marketing ‘contrarian’ the “purple cow.” Of course, investors are also rewarded for going against the crowd. John Templeton, Marc Faber, Jim Rogers, George Soros, and Sam Zell all created their wealth using contrarian investment principles. These investors were able to withstand the emotional instinct of conformity and the harassment of the majority. The contrarian investor who is wise of historical valuations and courageous enough to act against the herd is subsequently rewarded. As you can see from the chart above, U.S. short term interest rates have been falling since 1981. We would also like to point out that short term interest rates were 0% for 10 years from 1931 to 1941. With the investing herd worried about inflation as they did in 1929, lower rates are highly probable. While some might see our forecast as a bullish sign, we see it as a flight to quality. Most understand the harmful effects of high inflation from the recent experience of the 1970s. However they fail to realize the negative effect of extremely low interest rates: credit bubbles. Falling interest rates create confidence. Lending standards become relaxed. Easy credit creates liquidity which drives up asset prices. Leverage drives prices even higher. However, higher prices have an innate quality that guarantees their own destruction: at some point new participants cannot afford them. After a parabolic rise, asset prices exhaust themselves as the mania fails to bring in new participants. Leverage begins to work in reverse. Investors sell, as their debts now exceed their holdings. Interest rates fall to zero, as the remaining liquidity rushes to safety. 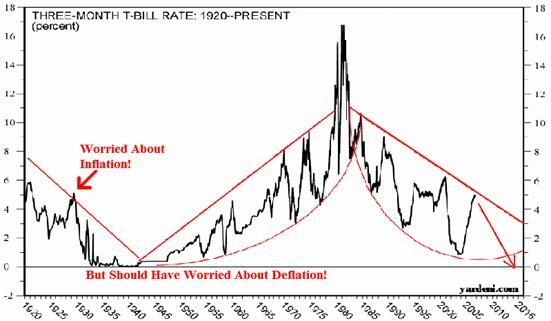 The major credit bubbles of the past: 1830’s, 1870’s, 1920’s; all occurred during a period of falling interest rates. Depressions of the 1840’s, 1880’s, and 1930’s followed these credit manias. According to the Economist, margin debt is now at its highest level since the 1920’s. As “liquidity” is given as the excuse for a bullish outlook for 2007, remember that liquidity created from credit is ephemeral and enjoyed at market peaks. When assets fall, investors can preserve their wealth in cash. The form of cash, we prefer is a three month United States Treasury Bill. This is a direct obligation on the taxing powers of the U.S. Government. An enterprising investor can buy these through the TreasuryDirect system. However the TreasuryDirect system does not currently support IRA accounts and requires self-direction. At Lamont Trading Advisors, we are liquidating overvalued assets and purchasing Treasury Bills for our clients (even in IRAs). The LTA Treasury Bill Account creates security of funds until market conditions warrant bargain hunting. For more details about this arrangement, contact us at our website. At Lamont Trading Advisors, Inc. we specialize in the management of risk and preservation of wealth. Visit our Current Strategy section for information on our asset allocation recommendations or contact us if you would also like to be notified when our investment analysis reports are published. Copyright ©2007 Lamont Trading Advisors, Inc. Paul Lamont is President of Lamont Trading Advisors, Inc., a registered investment advisor in the State of Alabama. Persons in states outside of Alabama should be aware that we are relying on de minimis contact rules within their respective home state. For more information about our firm visit www.LTAdvisors.net, or to receive a copy of our disclosure form ADV, please email us at advrequest@ltadvisors.net, or call (256) 850-4161.